The main feature of damage indicator – to inform the player about the direction of the damage. 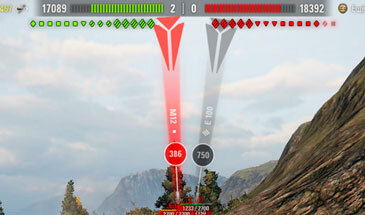 That the damage indicator will show the course of direction and distance to the enemy, which causes damage to the latter, with the help of bright red arrows. The difference between this mod from the others – its small size. Since mod looks neat and has a small size it is particularly relevant for players with a small diagonal. Do not forget to include advanced fire indicator that would work mods extended time display indicator.